Buy Biona organic coconut palm sugar 250g in the UK from our online shop or directly from our independent Scottish store. Organic Coconut Palm Sugar is the perfect alternative sweetener for drinks, desserts and baked goods. Who doesn't want chocolate on cold, January days? What's even better is that these cupcakes are dairy free and gluten free and made with low GI ingredients! This recipe contains 150 g coconut palm sugar. Gluten free soba noodles with fresh vegetables in a chilli peanut sauce This recipe contains 1tbsp palm sugar. This recipe contains 1tsp brown sugar or palm sugar. Oliebollen are normally made with milk, egg and wheat flour, but this recipe uses milk alternatives and no egg. So suitable for vegans. This recipe contains 1tsp coconut palm sugar. It takes a few days to get a sourdough starter going but once it’s active you can mix up your vegan pancake batter in the evening, let the magic happen overnight and cook these chunky pancakes for breakfast. This recipe contains 2 tbsp coconut blossom sugar. Where can you buy real Coconut Palm Sugar - Organic safely online? 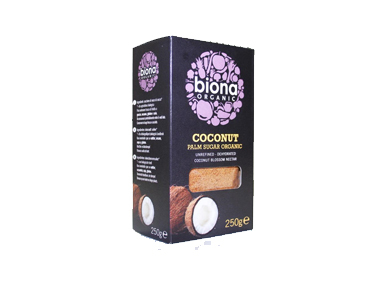 If you are wondering where you can buy Biona organic coconut palm sugar 250g safely online in the UK, then shop with us.